Cloud Star sent JakJak some Dynamo dog treats to try out for free in exchange for an honest product review. Cloud Star started making all natural dog treats in 1999. They’ve been around for nearly 15 years. They are located in San Luis Obispo, CA. One of the things I love about this company is that they love to give back and help others. They have a huge list of donation recipients on their website. They donate to non-profit organizations that benefit animals, women, children and the environment. Dynamo Dog Functional Treats are grain free, gluten free, free of wheat, corn, and soy. No artificial flavors or by-products are added, they are All Natural dog treats. These treats are made in the U.S.A.
Hip & Joint- These treats are bacon & cheese flavored. As the name implies it for hip & joint support. It contains glucosamine and chondroitin. Some other ingredients include pork, chickpea flour, carrots, apples, spinach and cheddar cheese. Skin & Coat with Salmon- Used for daily support of healthy skin and shiny coat. These treats contain Vitamin E and Salmon oil. Some other ingredients include salmon, chickpea and potato flour, maple syrup, carrots, apples, spinach, cherries, cranberries, and rosemary. 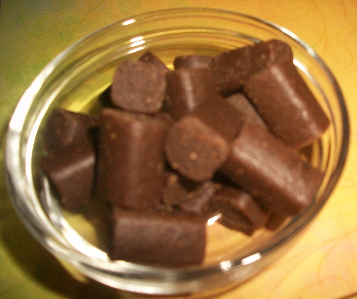 Tummy with Pumpkin & Ginger- These functional treats contain probiotics which help support dogs digestive health. Here are a few of the ingredients: pumpkin, ginger, peppermint, chamomile, lavender, rosemary and cerevisiae. Just looking at the ingredients you know that these treats are good for your dog. They are packed with healthy foods and herbs. The treats are about an inch long and 1/2 inch across. These treats are moist, not dry. It’s a nice texture change. I have been giving JakJak two treats from the Skin & Coat pouch for the past two weeks. He had really dry skin and would chew on himself. I woke up one morning and found a bunch of his fur beside my bed. He chewed his hair off! In the picture, you can see his fur is growing back and his coat is nice and shiny. I can say that the Skin & Coat treats worked for my dog. The very first ones we tried were the Tummy treats. My family loves to feed JakJak leftovers, even though they know I disapprove. I can always tell when he was fed table foods. His tummy starts gurgling and making funny noises. It will go on for hours, he just can’t digest those foods that well and they don’t agree with him. I gave him two of the Tummy treats a day for 2 weeks and I never once heard his tummy talking. As far as the Hip & Joint treats, I couldn’t see any changes or reactions. They have a chart on the back of the pouch so you know how many treats to give your pet each day. A dog weighing less than 26 pounds only needs 1/2 a treat a day. That means a 5-ounce bag will last your pet 58 days. JakJak is 55 pounds. He fell into the 55-89 Ib category, which is 2 treats a day. A 5-ounce bag would last 15 days. You can buy treats in 5 or 14 ounce resealable packages. I would recommend buying the larger bag. You would save about $5 if you bought the larger. Hell of a deal!! In my opinion, Cloud Star products work as intended. The ingredients they put into their treats are put in for a reason. They don’t add fillers or harmful products. thank you for sharing…i think i need to buy this for my dog..these are really great.